Oslo, December 12, 2015 – Acon Digital updates their reverb reduction plug-in DeVerberate to version 1.6. 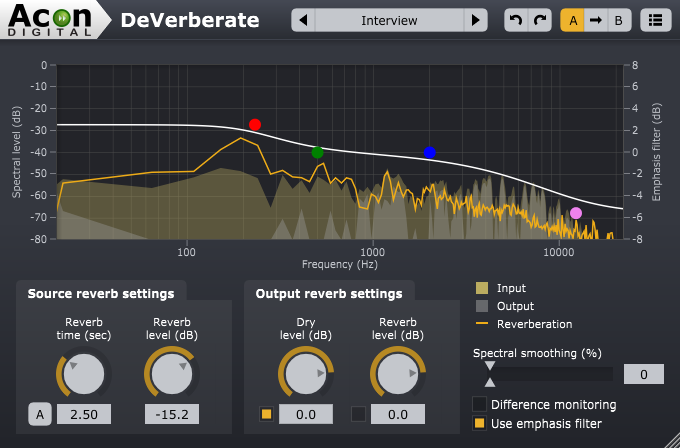 DeVerberate is a plug-in that separates the direct sound from the reverberation thus allowing users to attenuate or boost the reverberation already present in audio recordings. The algorithms have been improved to better preserve the direct sound and reduce unwanted effects on the volume envelope. Also new is the automatic estimation of the reverberation time based on the incoming audio. “We believe that the new automatic estimation of the reverberation time will make it much quicker and easier for our users to attenuate unwanted reverberation effectively without audible artifacts”, says Stian Aagedal, CEO and chief developer at Acon Digital before he continues: “The de-reverberation algorithm requires knowledge about the reverberation time in the original recording and we received feedback from our user base that dialing in the right value could be tricky. In these cases, the automatic estimation should make the plug-in much easier to use”. Acon Digital DeVerberate is available for both Windows (PC) and OS X (Macintosh) for $99.90 (USD) in the Acon Digital Online Store. The plug-in formats VST, AAX and AU (OS X only) are supported. Improved algorithm preserves the direct sound better and reduces unwanted effects on the envelope curve. New Automatic Estimation button estimates the reverberation time automatically based on the incoming audio. Acon AS was established in 1987 and offers products and consulting services with a strong focus on digital signal processing and audio processing. The company offers high quality software for digital audio editing, audio restoration and mastering. Acon AS took over the audio editing and processing product line from the German company Acon Digital Media GmbH on January 1, 2012. Acon AS will continue to develop and support these products in the future. If you don't want to receive press releases from us in the future, please click here to unsubscribe. Copyright © 2015 Acon AS. All Rights Reserved.